Central Kitsap Schools plans to phase out alternative programs as they’re known today. In their place, district leaders are asking the school board to create a new K-12 school in East Bremerton. The school will go into a building at McWilliams Road and Highway 303. The district bought the former call center this summer. “We’re improving learning experiences and outcomes for students,” said Jeremy Monroe, who is leading the creation of the new school. This year, the district consolidated its alternative schools and searched for a new home. But consolidation was a small step in an initiative to provide more learning options, increase graduation rates and improve college and career readiness for hundreds of students. Options at the new school would expand on successful elements of previous programs. Courses would be reinvented. School start and end times could be adjusted. Students would have new ways to demonstrate learning, such as through projects instead of traditional quizzes. The school is designed to help a wide variety of students. One student may learn best in a smaller, more personal learning environment and take most classes at the school and one or two online. Another student could learn most subjects from a parent but take a math class on campus. Yet another could spend a morning at an internship with a community partner and attend classes in the afternoon. The goal is to tailor the school experience to each student’s needs. “When students and families walk in our front door, we’ll be able to help them pick the program or schedule that’s right for them,” said Principal Stuart Crisman. Stronger ties with the community will also be evident. As the school grows, leaders envision the school as a community hub. In the building, they plan to partner with organizations to offer services to students and others in the neighborhood. The school will also work with community businesses and organizations outside the building. School leaders will begin to develop partnerships this winter. Beyond a new philosophy for the school, the district is also designing the school’s physical space. Staff and district leaders have worked with educational environment experts and architects to map out areas within the building’s 60,000 square feet. 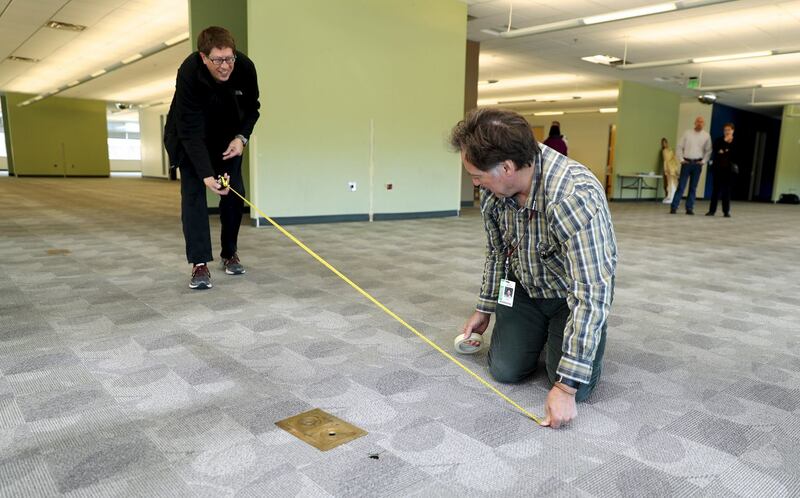 This winter, they will design lab spaces for chemistry, robotics and so-called makerspaces where students can use a variety of tools to engineer, network and create a variety of things. Part of the building will also be used for district offices and training areas. Although learning experiences will differ at the school, the goal is to foster a sense of school community for students and families. The school board is expected to choose a name for the school Dec. 14. After the school moves in next fall, students and staff will choose school colors and other elements that define their school’s identity. “We’re going to build a culture at the new school that will help students feel like they’re all part of one school,” Crisman said.